Here I kick off what will be a series of posts on IUU fishing. For us aficionados of all things fish, IUU is an acronym we use a lot. But we may not all have given it the depth of attention it deserves (myself included). In this series of an as-yet-undetermined length, I’ll aim to provide you with analysis of its many aspects, case studies, and hard numbers. “IUU fishing” is a term used to describe three types of fishing: illegal, unreported, and unregulated. What is especially interesting is that the three terms may overlap quite a bit, depending on the circumstances. The complexities and fuzziness of international law and politics meant we ended up with the term the way that it is. Illegal fishing refers to activities that are…well, illegal. A vessel either does not have permission to fish in a country’s territorial waters or it is fishing in a way that violates its flag state’s international agreements. The real tricky thing is in international waters. On the high seas, there are no legitimate fishing authorities, except where states agree to create them. So if a state is party to such a regional fisheries management organization (RFMO) and its fishing is in contravention to that agreement, it’s illegal. But what if a state isn’t party to such a regional fisheries agreement? As I discuss below, the legality is a bit fuzzy, so we need the term “unregulated” fishing. Also, what if an agreement is something that is not really enforceable, such as a United Nations General Assembly Resolution? In this case, yes, it is illegal. Resolutions 61/105 and 64/72 come to mind. These resolutions were agreed to unanimously by all UN member states and require that bottom fishing vessels on the high seas conduct environmental impact assessments (EIAs) and mitigate significant adverse impacts (SAIs) on vulnerable marine ecosystems (VMEs). (The UN is the greatest fountain of acronyms that I have ever known.) Unfortunately, many countries continue to ignore these resolutions. Unreported fishing refers to fishing activities that go…you guessed it…unreported. What’s funny about this term is that by the agreed international definition, some unreported fishing can be characterized as illegal fishing, while the rest can be characterized as unregulated fishing. The established definition requires some sort of mis-reporting in contravention of national laws or regional agreements. Sound illegal? Yep, but that’s not so in all cases. The “not-clearly-illegal” type of fishing occurs when a state is not party to an RFMO and goes fishing in the RFMO’s waters. I say “not-so-clearly-illegal” as some principles of international law say this would be illegal fishing, while others don’t. Under the Law of the Sea, for example, states are required to cooperate in regional agreements for the management of marine resources (see Part VII, Art. 118). However, at the same time, a core principle of international law is that states must give their “consent to be bound” by treaties. That is, states cannot be made party to a treaty without their consent. Ostensibly, a state could argue that it has cooperated in good faith to reach an agreement, but could not arrive at terms it felt were equitable. Therefore, this type of fishing falls counts as unregulated. Unregulated fishing refers to fishing activities of three types. The first is the not-exactly-illegal type of unreported fishing that I just touched on. The second are fishing activities on the high seas that are conducted by vessels flying no flag at all. This type is very clearly illegal. Fishing without a flag is a big no-no on the high seas (e.g. Part VII, Art. 90-92). And the third is fishing for species, or in areas, for which there are no applicable conservation or management measures (e.g. RFMOs). This third type of unregulated fishing will overlap with illegal fishing when it is done in a way that does not conserve living marine resources. Articles 116 and 117 of the Law of the Sea state that vessels are free to fish on the high seas, but that this is subject to, among other things, their duty to take “as may be necessary for the conservation of the living resources of the high seas” (Part VII). Of course, this is a rather mute point as it is illegal without any legitimate authority to act against it. Whew, if I haven’t completely lost you forever, I offer here a diagram of what I just discussed. 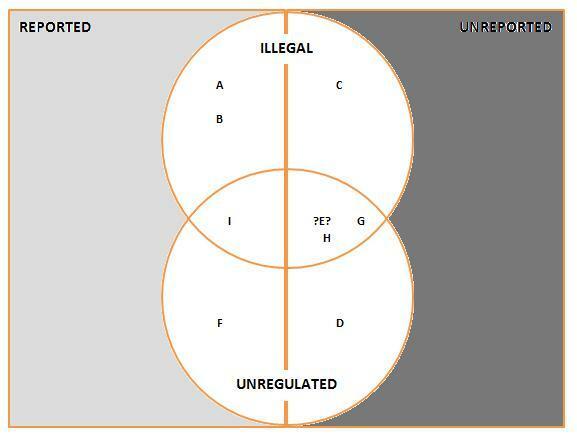 The light grey area is all legal, reported, and regulated fishing, just the type we really want. The dark grey area is probably not possible, but I leave it because I am either a) lazy, b) like the circles and think more boxes will get confusing, or c) both. A. Country X fishes more than its allocated quota under a regional agreement, to which it is party, and reports this catch to the RFMO. B. Country Y fishes in the territorial waters of Country Z using gear that is prohibited, and reports this fishing. C. ‘A’ and/or ‘B’ go unreported instead. D. Country Q fishes in an area under the authority of an RFMO, but it is not a member and does not report the catch. E. Is ‘D’ also illegal given international law requiring cooperation among states to manage high seas marine resources? Possibly, but the principle of ‘consent to be bound’ probably means ‘no’. F. Country Q (from ‘D’) reports the catch to the RFMO (just to let them know, apparently). G. A vessel goes fishing without a flag on the high seas, yet all vessels must be flagged under international law. It does not report its catches. H. Country W goes fishing in an area of the high seas that does not have an RFMO, and it is clear that this fishing is unsustainable. This very likely can be considered illegal as the Law of the Sea Treaty requires the conservation of living marine resources. I. Country U goes bottom trawling in areas where Vulnerable Marine Ecosystems are known or likely to occur; the RFMO in the area does not have the mandate to regulate this type of fishing; the catches are reported; no environmental impact assessment precedes this fishing and no steps are taken to minimize significant adverse impacts, though both are required by UNGA resolutions 61/105 and 64/72.